Thanks to the our special invitee Subha for coming to Pudiyador center over the weekend. She paid rapt attention to every item, I am sure she had a hard time saying which was No1, so everyone were declared winners. Silambattam: You have seen silambattam. For the uninitiated, a long stick is rotated skillfully held away from the body in a dextorous and beautiful manner. 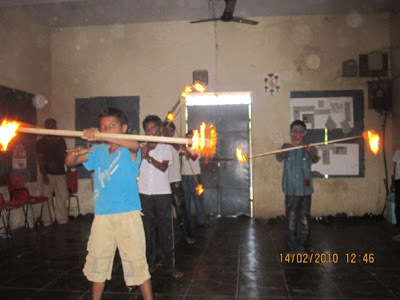 These children went one step further, they tied cloth to the ends of the sticks, doused it in kerosene and set them on fire. We had an amazing fire display! Five of these kids aged 10-14 years were on fire with their display! 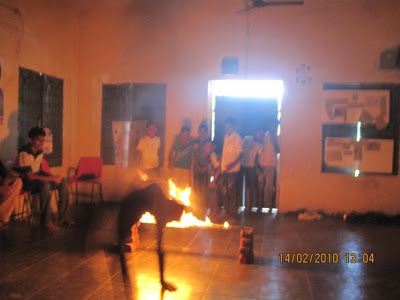 Then, they laid a stick (lit completely on fire) and jumped over it, somersault etc. You should’ve been there! All of us were going ooh-aah for this one. 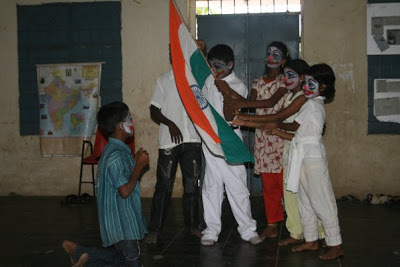 Skit/Mime/Drama: The children had make-up on their faces with powder and paint. 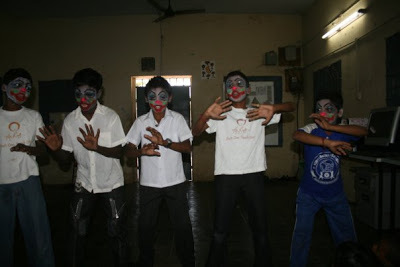 Set on the theme of creating awareness, about 6 boys mimed scenes like throwing the banana peel down, talking on the cellphone while driving, hanging out of a train, then they reenacted the scene depicting the proper way of doing this. Another mime was played out based on religious unity. To each of these scenes, the children did their own personal comedic touch. It was a very good one and apt! 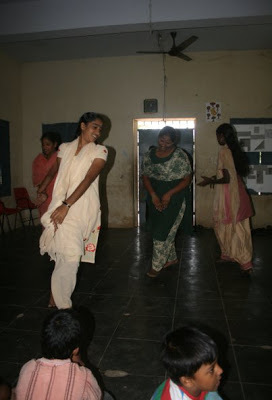 Dance: The younger girls did two popular dances, the older girls did one dance. I must say the bharatnatyam classes(that take place just before the Deepam sessions on sunday mornings) are having quite an effect. Such beauty and grace in their steps and movements. Kudos! The smallest kids (about 4-6) entertained us too. 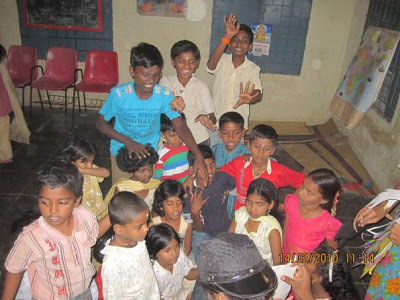 The credit for encouraging the children and bringing out their talent lies with the Pudiyador people. Their dedication to bring the best to these kids is outstanding. 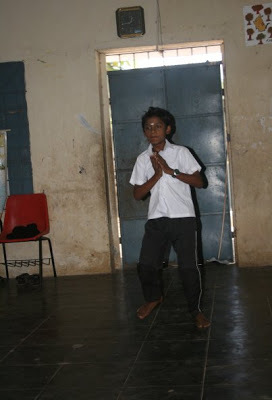 These kids were coached in dance and skit by Mr.Lenin. I have noticed the children here are so confident in their speech and manner. Last year’s talent event was amazing, but this year topped that too! I consider myself very lucky to have been a part of this rare performance.